The Pradera 2 Carat Pear Shape Cubic Zirconia Pave Halo Split Shank Engagement Ring features a 10x7mm simulated diamond look center surrounded by a halo of pave set rounds. Additional pave set rounds beautifully line down both sides of the split shank. This engagement ring is wonderfully styled in an updated design. 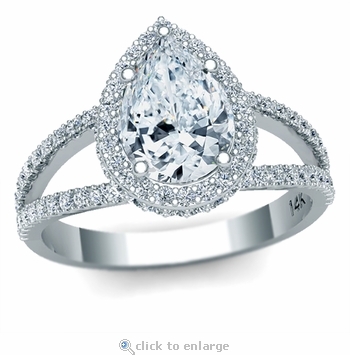 The pear shape combines the best of the oval and the marquise shape. 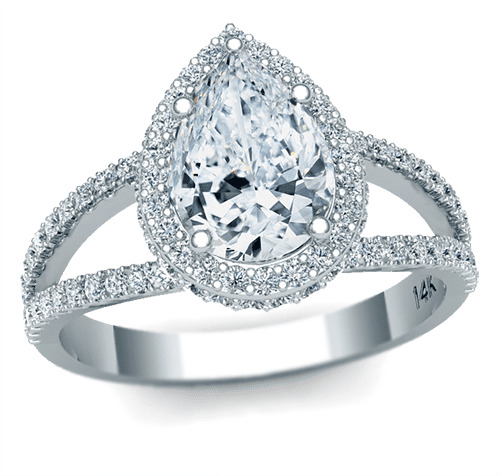 Our pear shaped cubic zirconia has 58 hand cut and polished facets and is shaped like a sparkling teardrop. 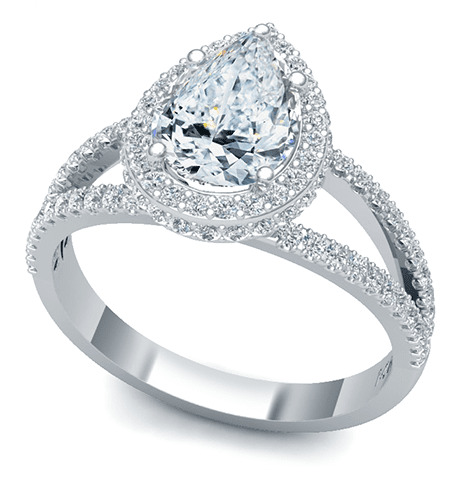 Its shape compliments a hand with small or average-length fingers. Our Russian formula cubic zirconia is hand cut and hand polished to exact diamond specifications and is set in a high quality mounting made in solid 14k white gold, 14k yellow gold, 14k rose gold, 18k white gold, 18k yellow gold, or luxurious platinum. Center stone color options include man made red ruby, green emerald and blue sapphire in addition to diamond look, yellow canary and pink simulated diamond look. Finger sizes 5 through 8 are listed in the pull down menu and larger and smaller sizes are available. For further assistance, please visit us via live chat or call us directly at 1-866-942-6663, option 2 to speak with a knowledgeable representative.